New advancement in the treatment of eczema. Results guaranteed. New advancement in the treatment of eczema. Results guaranteed. 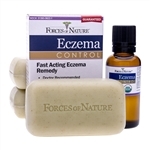 Combo medicine pack of Eczema Control and Eczema Cleanse. Clears Eczema. Results Guaranteed! New advancement in the treatment of eczema. Results guaranteed. Value Size. "Atopic" eczema, which often runs in families, is a condition that causes excess inflammation of the skin. Atopic Dermatitis (AD) is a disease that causes inflamed, itchy skin. It typically affects the insides of the elbows, backs of the knees, and the face, but can cover most of the body. Even though most people with atopic eczema have a family member with a similar problem, approximately 20 percent of those suffering from atopic eczema may be the only one in their family bothered by this condition. AD is a very common disease, present worldwide, though it is more common in urban areas and developed countries. An estimated 10% of all people are at some time affected by AD (may not apply in the tropics.) 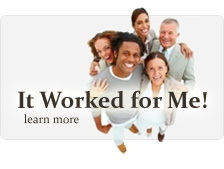 It affects men and women of all races equally. Eczema in children is also very common. AD tends to flare-up when the person is exposed to certain trigger factors. These substances or conditions worsen the dermatitis, such as dry skin, irritants, allergens, emotional stress, heat and sweating, and infections. Additionally, extreme cold or hot temperatures, or sudden changes in the temperature, are poorly tolerated by persons with AD. The best line of defense against AD is prevention. 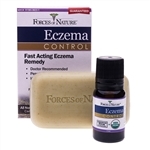 At the very outset of the beginning of a flare up, prompt eczema treatment with Eczema Control or other medication as directed by a physician is important. There’s no such thing as an eczema cure, but a lot can be done to alleviate the symptoms. Cortisone (steroid) creams applied directly to the affected area are a mainstay of therapy. However, overuse of highly potent steroids can be damaging. Cortisone pills or shots are also a common treatment for eczema, but they are often not safe for long-term use. Tar baths, antihistamines, and antibiotics are often used, but these, too, meet with limited success. 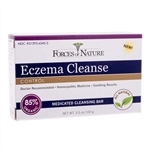 Home remedies for eczema, such as vitamins, mineral or nutritional supplements, don’t seem to work. The same is true of a modified eczema diet, which usually consists of avoiding certain foods and increasing your consumption of certain nutrients. Using an eczema cream or moisturizer can help prevent dry skin. However, it is important to find a moisturizer which is transdermal and can safely penetrate into the cell membranes. The certified organic oils and extracts in Eczema Control moisturize the skin, making it flexible and less likely to crack. The triple unsaturated fatty acids in Eczema Control help strengthen cell membranes and assist to keep the skin moisturized. Research has found that effective moisturizers are ointment bases with these triple unsaturated fatty acids. Lotions contain water and alcohol which can actually dry the skin and are usually inadequate to treat dry skin from eczema. This is why Eczema Control contains no water or alcohol and also is effective to heal damages skin. People with AD are prone to skin infection. In general, infections are hard to prevent but should be treated promptly to avoid aggravating the AD. It is important that persons with AD, or their parents, learn to recognize the early signs of skin infections and treat the condition immediately. Sometimes viral illnesses such as colds or flu cause AD flare-ups. To stop the problem from getting worse, people with AD should take extra care of their skin while the virus runs its course. People with AD do not have to be limited by their disease. 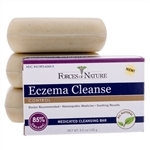 It can be controlled and treated with Eczema Control.